Yoga is about mindfulness and can be practiced anywhere and anytime. If you can sit on a low swing in a playground, you can do aerial yoga. 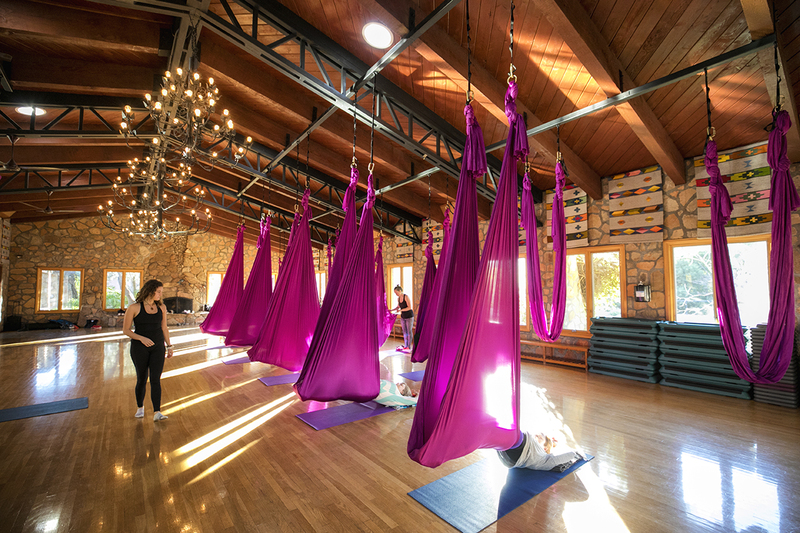 Ranch Instructor Hazel Stricker and Guest Specialty Instructor Jessica Rubin answer a few questions about The Ranch’s 45 minute Aerial Yoga class. What is a Ranch aerial yoga class like? 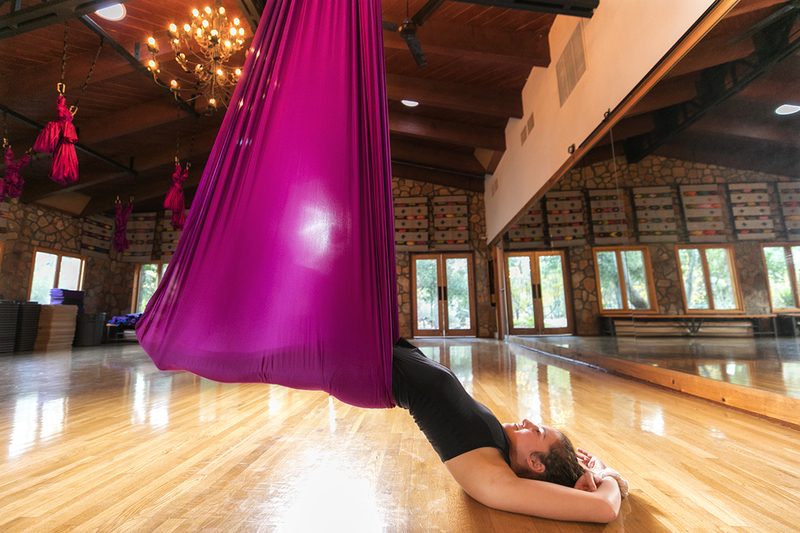 A Ranch aerial yoga class includes a variety of yoga positions that are partially or fully supported in a silk-like hammock hanging 8-12 inches from the floor. During the class, you’ll feel secure, close to your mat, while still experiencing elevation and support. You may do inversions, hip openers, hamstring stretches, and of course, plenty of restorative postures. With the gentle approach and support of the cocoon-like fabric, students may be able to hold or even deepen poses that might have previously been inaccessible. What are some benefits of taking an aerial yoga class? With the generous support offered by the hammocks, you might experience a deeper stretch, a sense of spinal decompression, and a greater sense of relaxation. Expect some challenges in terms of strength and balance. You might get a better stretch in class due to the support that allows you to be held and surrender more deeply. It’s quite possible you’ll have more confidence and walk with a bounce in your step when you are done from trying something new! You must be under 250 lbs to participate in an aerial yoga class. What should I wear to aerial yoga? To keep the fabric clean, please wear clothing that covers your armpit area and back of knees. Please wear socks. Tighter fitting clothing is recommended, as looser items are more likely to get in the way and cause discomfort. It’s important to remove all jewelry, watches, hair clips, and zippers to keep the fabric from tearing. Finally, please remove all oil or lotion from your skin as to not stain the fabric. Covering as much skin possible is ideal for cleanliness as well as comfort. What should I eat before an aerial class? Have a small amount of food in your belly. Try not to come to class hungry. Coming hungry can increase the chance of lightheadedness. People ask if they’ll get dizzy. Some people experience dizziness or uneasiness in their first few aerial yoga classes, especially if getting inverted is something they haven’t done in years. Going upside down is not for everyone! As in any Ranch class, please listen to your body and give yourself permission to take a break at any time. For what conditions is aerial yoga NOT recommended? If you’re past your first trimester in pregnancy or have had a recent cesarean you shouldn’t participate. You really need to be able to see the demonstration so if glaucoma is an issue then you should skip this class. We rely on our hands to grip the fabric, so if you have carpal tunnel syndrome or recently had a surgery that affects your grip, we recommend trying a different yoga class. Or, if hanging upside down causes discomfort, and we spend a fair amount of time upside down, then I’d say skip this class. Occasionally, we use pure essential oils near the end of class when we’re laying on our mats to encourage relaxation. Please let the instructor know at the beginning of class if you have allergies or sensitivities to a particular aroma. Space is limited so please arrive at least five minutes before class to set up your hammock and leave your shoes by the door. Have fun! Namaste. 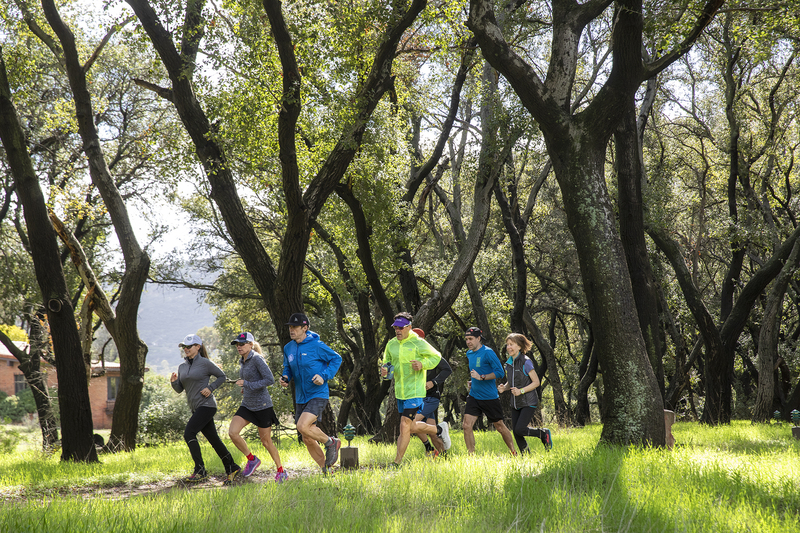 Stretch deeper into your life with these fine classes. Or see more of our award-winning fitness offerings.